Alumna Teri Greeves, a beadwork artist who lives in Santa Fe, N.M., is profiled in this video from the PBS series Craft in America. 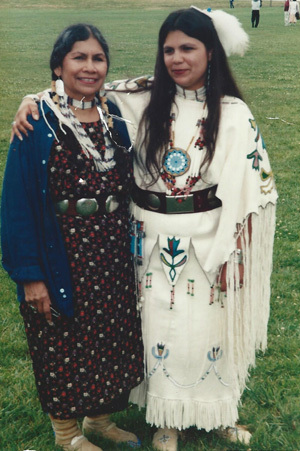 Teri Greeves's mother and sister beaded a buckskin dress and presented her with a pair of Kiowa moccasins from the 1800s and a white eagle feather fan for her graduation from UC Santa Cruz in 1995. 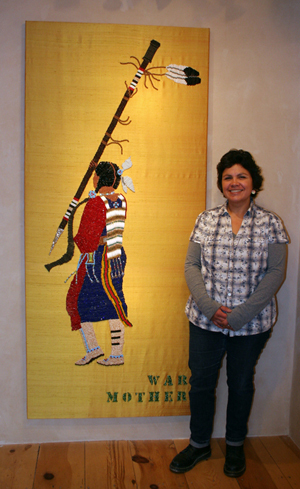 Greeves stands next to a six-foot beaded wall hanging she made that tells the story of centuries of Kiowa women watching their men go into battle. Titled "War Mother," the piece includes powerful symbols of conflicts from the Indian Wars to the Iraq War. When Teri Greeves was little, her mother put her and her sister to work as sales clerks at the trading post she ran at the Wind River Reservation in west-central Wyoming. There, Greeves and her sister would parrot her mother’s sales patter, describing the provenance of moccasins, pottery, and pipe bags to tourists who descended on the store. But what Greeves didn’t realize was that her mother, Jeri Ah-be-hill, a Kiowa of Oklahoma, was also teaching her two daughters. It was in that crowded trading post that a long line of Native American beadworkers also taught Greeves a craft that would later become her art. Today, Greeves uses the traditional skill to tell stories in new ways, to create a new language that draws people together, with the result that her work is now on permanent display at the Smithsonian in Washington, D.C.; the British Museum in London; the Museum of Art and Design in New York; and the Portland Art Museum in Oregon. Last year, she was also named a Living Treasure for the Native Treasures Indian Arts Festival, a major fundraiser for the Museum of Indian Arts & Culture in Santa Fe, N.M.
Greeves is talkative as she sits in her light-filled studio in a juniper forest outside of Santa Fe. She tells the story of her grandmother, Sarah Ataumbi Big Eagle, an accomplished beadworker who was born in a tipi during the Indian Wars and supported four children with her craft. She tells of her mother, a shrewd businesswoman who curated her shop as if it were an art gallery and yet would buy a beaded purse simply because she knew its maker needed money. She talks of how being raised on a Shoshone-Arapahoe reservation influenced her pictorial style, about shifting beadwork from a decorative craft to a form of artistic expression. Her pieces include wall hangings, wrist cuffs, purses, and even Converse sneakers. Her art, Greeves says, is a form of communication, which is what compels her to work. The beaded sneakers in the Smithsonian, for instance, tell the story of the ah-day, the favored child in each Kiowa family who was singled out for special attention. The fact of a favorite child may seem unfair, but Greeves believes the ah-day was a tradition that ensured the survival of at least one child as the nomadic Kiowa traveled in search of game and fought wars. That this ancient story is told on a pair of modern sneakers is a way to draw people in, to break barriers, according to Greeves. It’s also part of the reason Greeves agreed to co-curate a first-of-its-kind exhibit with the Minneapolis Institute of Art (MIA) that will explore the art of Native American women from ancient times to the present. It is set to open in fall 2018. Greeves says her work often starts as “this little thing rolling around like a pebble in my shoe and I have to deal with it.” Whether it is social, cultural, political, or spiritual, that idea will result in hours of research and critical introspection—abilities, Greeves says, she acquired at UC Santa Cruz. “Without those skills, I know that my work wouldn’t be as deep or inquisitive,” Greeves says. “I know they make a difference." She grows nostalgic as she tells of her mother and sister beading a buckskin dress and presenting her with a pair of Kiowa moccasins from the 1800s and a white eagle feather fan for her graduation from UC Santa Cruz. And although both her grandmother and mother are gone now, there are times as Greeves works that she says she feels herself connecting to some greater force. “And when you open yourself up to that connection, it flows through you and comes out your hands,” Greeves says, “and when that flow is happening, that is the voice of my mother and grandmother and all the other people who came before me.